For the former tight end, see Josh Norman (tight end). Joshua R. Norman (born December 15, 1987) is an American football cornerback for the Washington Redskins of the National Football League (NFL). He played college football at Coastal Carolina, and was drafted by the Carolina Panthers in the fifth round of the 2012 NFL Draft. He is considered to be one of the best cornerbacks in the NFL. Norman attended Greenwood High School and, during his junior season, was a teammate of future Carolina Panther Armanti Edwards. In 2006, Norman was the only two-way player on his high school team that won the South Carolina State Championship. He was named an All-State football player and was selected to participate in the North-South All-Star Game. He was also named to the All-Lakeland Region 4A on offense and also participated in basketball, baseball, and track throughout high school. Despite a decorated high school career, Norman had no scholarship offers from any Division I schools. Norman began college by taking courses at Horry Georgetown Tech while living with his brother, Marrio Norman, who earned a full scholarship in football to Coastal Carolina. The following year in 2008, Norman was offered a spot on the Chanticleers as a walk-on. During his true freshman year at Coastal Carolina in 2008, Norman played in all 12 games with 7 starts. During his first start against North Carolina A&T, Norman recorded his first interception. He recorded 26 solo tackles and 35 total tackles, tying for ninth most tackles on the team. He ranked fifth in the Big South with 9 pass defenses and 2 interceptions. He earned Big South Freshman of the Week honors after his 7 tackle, 1 interception, and 1 pass defensed performance in a win over Presbyterian and had at least one tackle in 11 of 12 games. After his freshman year, Coastal Carolina gave Norman a scholarship. During his sophomore season, Norman was named a third-team All-American by the Associated Press and made the College Sporting News' "Fabulous Fifty" All-American team. He also earned first team All-Big South. During the season, he broke the league record and tied for second in the nation with eight interceptions. He ranked third in interceptions per game with 0.73 and led the league with 15 pass breakups, tying eighth nationally with 1.36 per game. He also ranked 6th on the team with 35 tackles and led the team with 2 blocked kicks. He earned Big South Defensive Player of the Week and National Defensive Player of the Week after tying a Big South record with 3 interceptions in a game in a win over Gardner-Webb. During his junior season, Norman again earned 1st team All-Big South. He ranked fifth on the team with 56 tackles and 3rd in the Big South with 9 pass defenses. He also recorded another blocked field goal, bringing him one shy of the Coastal Carolina record. In 2011, Norman was a preseason All-American and All-Big South conference as well as being listed as one of the top 10 defensive backs for 2011 by The Sporting Network. Additionally, he was voted onto the 2011 AFCA Football Championship Subdivision Coaches' All-America Team. For his college career, Norman tied for 2nd in Coastal Carolina history with 11 career interceptions and pass breakups with 23. Norman graduated from Coastal Carolina University with a communications major and dramatic arts minor. Despite a decorated college career, Norman was a projected day 3 pick in the 2012 NFL Draft. Norman was praised for his frame, build, scheme-versatility in both man and zone coverage, physicality, quick feet, hand use to stay with receivers, hip fluidity, instincts, confidence, closing speed, and ball skills as a cornerback; however, there were concerns over his tendency to guess routes and development time in the jump in competition from a small school to the NFL. Norman began to draw attention in the pre-draft process thanks to a strong week of practice in the East-West Shrine Game. Norman was only the third Coastal Carolina player ever to be drafted, after Tyler Thigpen in 2007 and Jerome Simpson in 2008. He was drafted with the 143rd pick by the Carolina Panthers in the 2012 NFL Draft. Norman signed a four-year, $2.3 million contract with the Carolina Panthers, including a $199,000 signing bonus. After a strong OTAs where Norman earned high praise from both the coaching staff and Panthers receiver Steve Smith, Sr., Norman was tabbed as the starting cornerback opposite Chris Gamble. Norman played in 16 games and started 12 games as a rookie and was on the field for 88 percent of the total snaps the Carolina defense played. He recorded his first career interception on Chicago quarterback Jay Cutler during the Panthers week 7 loss to the Chicago Bears. Although he showed promise, Norman struggled to make the giant leap in competition and was eventually benched during the Panthers week 14 win over the Atlanta Falcons. Norman finished his rookie season with 73 tackles, 1 interception, and 7 pass defensed. During his second season, despite a strong preseason where he led the preseason in interceptions, Norman only played in seven games and was inactive for five more. He fell behind veterans Captain Munnerlyn, Drayton Florence as well as rookie UDFA Melvin White on the depth chart. The Panthers ascended to become the league's second-best defense, finishing first in the NFL with 60 sacks in 2013, second in points per game, and third in DVOA team defense. Despite losing Captain Munnerlyn in free agency to the Minnesota Vikings as well as Drayton Florence, Norman was not considered the team's first option to start opposite Melvin White to begin the year. The Panthers signed free agent cornerback Antoine Cason as well as drafted Bene Benwikere during the 2014 NFL Draft and there was some thought that Norman could be released during the offseason. Norman again had a strong preseason and started the season backing up both Antoine Cason and Melvin White. Norman regained his starting position in the lineup by week 8 and his strong performances facilitated the Panthers to release Cason after the Panthers Week 13 loss to the Minnesota Vikings. Norman began to excel as the Panthers number 1 corner with a string of superb performances, holding Jeremy Maclin to 3 catches for 38 yards, Mike Evans to 2 catches for 13 yards, Josh Gordon to 4 catches for 48 yards, and in two contests against the Atlanta Falcons, he held Julio Jones to 10 catches for 117 yards. Throughout this span, he gave up only one touchdown and quarterbacks had a 49.6 passer rating when throwing it in his direction. Additionally, over the final 8 weeks of the season, Norman was rated as the 27th best cornerback by Pro Football Focus. During the Panthers wildcard playoff victory over the Arizona Cardinals, Norman gave up only one reception for nine yards in coverage. Over his final seven starts, Norman surrendered only 13 catches on 33 targets. For the season, Norman was targeted 58 times, but only allowed 27 catches for 291 yards and just 74 yards after the catch. The 46.6% catch rate was second best in the NFL among starters behind only Vontae Davis. During the year, Norman allowed just 0.77 yards per snap in coverage and opposing quarterbacks generated a passer rating of 53.2 when targeting Norman. Between interceptions and passes defensed, Norman also broke up 10 passes. According to Football Outsiders cornerback rankings, which measured yards per pass and success rate (number of targets on which the corner prevented a successful gain), Norman rated as their 4th best number 1 cornerback (cornerback on each team who faces the most opposing targets against opponents' No. 1 receivers) in the NFL during the 2014 NFL season behind only Darrelle Revis, Vontae Davis, and Chris Harris, Jr..
Norman picked up where he left off from 2014. During the season opening victory against the Jacksonville Jaguars, Norman was thrown at nine times, allowed just three completions for five yards, and managed to force a fumble and collect a pick-six against quarterback Blake Bortles. Norman followed this up during the Panthers week 2 victory over the Houston Texans where he allowed just 40 yards in coverage on 12 attempts, no first down receptions, while helping to limit DeAndre Hopkins to 5 receptions and 53 yards for the game. The following week, Norman sealed a 27-22 win against the New Orleans Saints after an interception in the end zone on a pass by Luke McCown intended for Brandin Cooks with a minute remaining in the game. Through the first three weeks of the season, the only two cornerbacks who were targeted 20 or more times and had not allowed a pass for more than 16 yards were Norman and teammate, Bene Benwikere. Further, through that span, Norman did not allow 50 yards receiving in a game and quarterbacks generated a 38.8 passer rating when throwing in his direction. For his efforts, Norman was named the NFC’s defensive player of the month for September. The following week, in a 37-24 victory over the Tampa Bay Buccaneers, Norman became the first cornerback since Charles Woodson in 2008 with 2 INT-TDs in the first 4 weeks of a season. Against the Buccaneers, Norman was targeted 8 times and allowed only two receptions for 31 yards, while recording 2 interceptions and 2 pass defenses. Further, Jameis Winston had a 3.6 quarterback passer rating when targeting Norman. He was named the NFC defensive player of the week for his performance. Through the first four weeks of the season, Norman had been targeted 35 times and allowed a 42.9% completion percentage for 129 yards to go along with 4 interceptions. During this time, opposing quarterbacks recorded a 23.1 quarterback passer rating when targeting Norman, which ranked first in the NFL above Darrelle Revis, who allowed a 23.9 quarterback passer rating when targeted during this same time. During a week 6 victory over the Seattle Seahawks Norman was only targeted twice for -2 yards both on screen passes. After the game Norman said of Russell Wilson, "He was the smartest quarterback we've played so far this year because of that." Through the first six weeks of the season, Norman allowed just 46 percent of those 37 passes to be caught and opposing passers throwing his way had a passer rating of just 24.1, the best mark in the NFL. Additionally, he allowed just 17 receptions for 127 yards (7.5 per catch). During the Panthers week 7 victory over the Philadelphia Eagles, Norman recorded 3 tackles, 2 pass deflections and gave up 1 catch for 3 yards in coverage. Through the first 7 weeks, Norman graded as PFF's best cornerback in the NFL. Norman went up against T. Y. Hilton during a rainy Monday night victory over the Indianapolis Colts. He gave up only one catch on three targets for 15 yards. After the game Norman said "I was the Dark Knight today -- I was Batman. ... Had to come in and save a couple people." During the Panthers' 44-16 victory over the Washington Redskins to move them to 10-0, Norman had 4 solo tackles and forced a key fumble. During the Panthers 33-14 victory over the Dallas Cowboys on Thanksgiving, Norman shadowed Dez Bryant on Bryant's 43 snaps on the perimeter and limited him to one catch for 6 yards. During the Panthers week 14 victory over the Atlanta Falcons, when matched up with Julio Jones, Norman limited him to four catches on six targets for 33 yards. Over the first 14 weeks of the season, Norman held DeAndre Hopkins, Mike Evans, T. Y. Hilton, Dez Bryant, and Julio Jones to a combined 9 receptions for 89 yards. During the Panthers' week 15 game, which resulted in a 38-35 victory over the New York Giants, Norman had a high-profile contest with receiver Odell Beckham Jr.. Before the game, Norman allegedly threatened Beckham with a baseball bat while using homophobic slurs. During the game, Norman was targeted 6 times when matched up with Beckham and gave up 4 receptions for 30 yards and a touchdown. Tempers flared between the two players with Norman committing 2 personal fouls and Beckham committing 3 personal fouls, which included a hit to the head of a defenseless Norman that later resulted in a 1-game suspension for Beckham. Norman was selected for his first career Pro Bowl during the season. On December 23, 2015, Norman was fined a combined $26,044 for a face mask penalty, and for striking an opponent in the head against the Giants. During the final game of the regular season, Norman held Mike Evans to 15 yards from 1 catch on 5 targets. For the season, opposing quarterbacks had a passer rating of 54.0 when throwing at Norman, the lowest rating allowed by all NFL corners. Norman recorded 56 tackles, 18 passes defended, 4 interceptions, 3 forced fumbles, 2 fumble recoveries and helped the Panthers win a team record 15 games for the 2015 season. In the Divisional round against the Seattle Seahawks, Norman recorded 5 tackles and 1 sack. He helped the Panthers defeat the Seahawks 31-24. In the NFC Championship game against the Arizona Cardinals, Norman recorded 2 tackles and 2 passes defended as the Panthers defeated the Cardinals 49-15 to advance to Super Bowl 50. In the Super Bowl, Norman recorded 2 tackles and 2 passes defensed, but the Panthers lost 24-10 to the Denver Broncos. On April 20, 2016, the Panthers rescinded their franchise tag placed on Norman after he and the team failed to come to an agreement on a long term deal, making him an unrestricted free agent. On April 22, 2016, two days after his release from the Panthers, Norman signed a five-year, $75 million deal with the Washington Redskins. The contract made him the highest paid cornerback in NFL history at the time, surpassing the contract Darrelle Revis signed with the New York Jets in 2015. During the team's training camp, Norman announced that he would appear regularly during that season's Fox NFL broadcast, which brought some controversy. ↑ Dubin, Jared. "Champ Bailey: Josh Norman is 'ridiculous', deserves top CB money". CBSSports. Retrieved 6 June 2016. Newton, David. "Panthers' Josh Norman may have surpassed Richard Sherman, but don't tell him that". ESPN. Retrieved 6 June 2016. Jones, Mike; Tesfatsion, Master. "How one of the NFL's best cornerbacks suddenly ended up with the Redskins". Washington Post. Retrieved 7 June 2016. Brooks, Bucky. "Why there are no true shutdown corners today; my top five CBs". NFL.com. Retrieved 27 June 2016. Ruiz, Steven. "The NFL's top 10 cornerbacks, ranked". USA Today. Retrieved 27 June 2016. 1 2 3 4 5 Flagler, Jack. "Who is Josh Norman? Panthers corner took winding road to the NFL - News - Gaston Gazette - Gastonia, NC". Gaston Gazette. Retrieved 2015-11-27. 1 2 3 4 Josh Norman. "Josh Norman Bio - Coastal Carolina Official Athletic Site". Goccusports.com. Retrieved 2015-11-27. ↑ Flagler, Jack. "Who is Josh Norman? Panthers corner took winding road to the NFL - News - Shelby Star - Shelby, NC". Shelby Star. Retrieved 2015-11-27. ↑ "Josh Norman Thriving on Field and in Spotlight". Blackandbluereview.com. 2015-10-07. Retrieved 2015-11-27. 1 2 "Josh Norman, Coastal Carolina, NFL Draft - CBSSports.com - NFLDraftScout.com". CBSSports.com. Retrieved 2015-11-27. ↑ "NFL Events: Combine Player Profiles - Josh Norman". Nfl.com. 2013-02-13. Retrieved 2015-11-27. ↑ "Josh Norman | Coastal Carolina, CB : 2012 NFL Draft Scout Player Profile". Nfldraftscout.com. 2006-09-21. Retrieved 2015-11-27. 1 2 3 "Recent news on Josh Norman - Carolina Panthers". Rotoworld.com. Retrieved 2015-11-27. ↑ "Josh Norman Stats - Carolina Panthers - ESPN". Espn.go.com. 1987-12-15. Retrieved 2015-11-27. 1 2 Brent Sobleski. "Josh Norman's Matchup vs. Julio Jones Will Determine NFC South". Bleacher Report. Retrieved 2015-11-27. ↑ "Panthers 27 Cardinals 16: Handing Out the Grades". Cat Scratch Reader. Retrieved 2015-11-27. 1 2 "Byron Maxwell among most targeted CBs". Profootballfocus.com. Retrieved 2015-11-27. 1 2 3 4 "Josh Norman is an elite cornerback". Profootballfocus.com. Retrieved 2015-11-27. ↑ "2014 PFF All-NFC South Team". Profootballfocus.com. Retrieved 2015-11-27. ↑ "Innovative Statistics, Intelligent Analysis | Best Cornerback Stats 2014". Football Outsiders. 2015-05-28. Retrieved 2015-11-27. ↑ "Top players at every position for Week 1". Profootballfocus.com. Retrieved 2015-11-27. ↑ "Texans-Panthers | Week 2 NFL Grades". Profootballfocus.com. Retrieved 2015-11-27. ↑ Jill R. Dorson (2015-09-29). "ASN's NFL Top 10: Defensive backs steal the show in Week 3 | American Sports Network". Americansportsnet.com. Retrieved 2015-11-27. ↑ "PFF NFL power rankings for Week 4". Profootballfocus.com. Retrieved 2015-11-27. 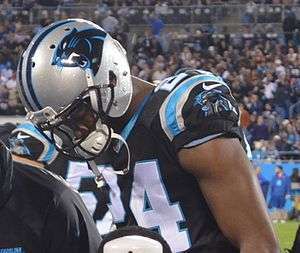 ↑ "Panthers corner Josh Norman named NFC defensive player of month | ProFootballTalk". Profootballtalk.nbcsports.com. Retrieved 2015-11-27. ↑ "Rapid Reactions: Panthers Beat Bucs, Improve to 4-0". Blackandbluereview.com. 2015-10-04. Retrieved 2015-11-27. ↑ "Panthers-Buccaneers Grades". Profootballfocus.com. Retrieved 2015-11-27. ↑ "Josh Norman is the NFC defensive player of the week | ProFootballTalk". Profootballtalk.nbcsports.com. Retrieved 2015-11-27. ↑ "Panthers 27 Seahawks 23: Handing Out the PFF Grades". Cat Scratch Reader. 2015-10-19. Retrieved 2015-11-27. ↑ "Josh Norman Takes Another Step, Without Highlights". Blackandbluereview.com. 2015-10-19. Retrieved 2015-11-27. ↑ "What makes Josh Norman NFL's top CB this year". Profootballfocus.com. Retrieved 2015-11-27. ↑ "Eagles vs. Panthers - Box Score - October 25, 2015 - ESPN". Espn.go.com. 2015-10-25. Retrieved 2015-11-27. ↑ ""Information about football you simply can't get anywhere else"". ProFootballFocus.com. 2015-11-23. Retrieved 2015-11-27. ↑ "Josh Norman on rainy win: 'I was the Dark Knight'". NFL.com. 2015-11-03. Retrieved 2015-11-27. ↑ "Watch Washington Redskins vs. Carolina Panthers [11/22/2015". NFL.com. Retrieved 2015-11-27. ↑ "Josh Norman of Carolina Panthers says Dez Bryant of Dallas Cowboys disrespected him". Espn.go.com. Retrieved 2015-11-27. ↑ Forget 38-0: NBC’s Rodney Harrison says Julio Jones is still better than Josh Norman. The Charlotte Observer. Retrieved September 13, 2016. ↑ Newton, David. "Panthers pull CB Josh Norman's franchise tag". ESPN. Retrieved 21 April 2016. ↑ "CB Josh Norman has 5-year, $75M deal with Redskins, source says". ESPN. Retrieved 23 April 2016. ↑ Czarda, Stephen. "Redskins Sign Cornerback Josh Norman". Redskins.com. Retrieved 23 April 2016. ↑ Gaines, Cork. "Josh Norman agrees to a monster $75 million contract with the Washington Redskins". Business Insider. Retrieved 7 June 2016. 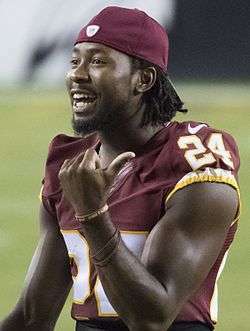 ↑ "Josh Norman Joins Fox". mmqb.si.com. Retrieved 10 August 2016. ↑ Samuel, Ebenezer. 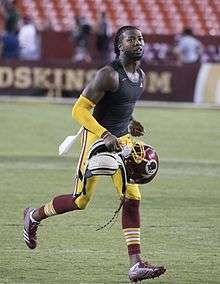 "Josh Norman defends decision to contribute to Fox Sports during Washington season: 'It's my time off'". New York Daily News. Retrieved 10 August 2016. Wikimedia Commons has media related to Josh Norman (cornerback).